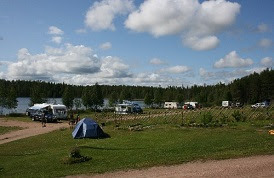 Accommodation has been provided for travellers arriving at Korvala for over one hundred years. 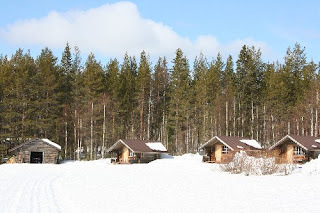 Nowadays, we have a variety of self-catering log cabins available, each with different facilities ranging from the basic to the more fully equipped. All have electric heating and hot & cold running water. Our tap water is pure spring water to the highest drinking water standards. 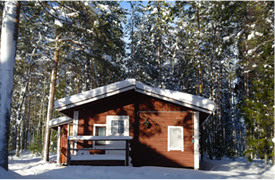 The cabins look out over the lake and have been hand-made by Seppo in the early eighties, first by cutting the trees and hewing the logs before setting to work on the building process. The cabins were upgraded in 1994 and again in 2006. We have 3 grey log cabins, consisting of a bedroom with two or four beds with duvets and pillows; kitchenette with fridge & cooker, microwave oven, coffee percolator, cooking utensils and tableware; and a washroom with shower and wc. Price: 65€/cabin/night/2 persons, 5€/additional person. 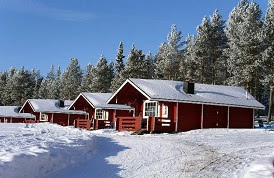 We have 6 red log cabins, consisting of a small bedroom with bunk beds for up to four persons with duvets and pillows; a washroom with shower and wc; and a living room with TV, fireplace, sofa bed and kitchenette including fridge, cooker, coffee percolator, microwave oven, cooking utensils and tableware. Sleeps up to six. Price: 75€/cabin/night/2 persons, 5€/additional person. We have one larger log cabin, as above, but with a separate bedrooom for three persons with two beds as bunks and one as a separate single bed, and a main living room with four beds as bunks and one as a separate single bed. Kitchenette as above. Sleeps up to eight. Price: 85€/cabin/night/2 persons, 5€/additional person. Skis, snowshoes and ice fishing equipment are free to use in winter. Fishing in our lake and use of our boats, canoes, the grill hut, playground, swimming areas and beach ball court in summer is included in the price of accommodation. If a cabin is rented for one week, the 7th night is free. Payment can be made on arrival - we accept all major credit cards and euros. Hire of a set of sheets (under sheet, duvet cover and pillowcase) and towel costs 10€/person. Hire of the lakeside sauna costs 15€ for two people, 20€ for a family or 7.50€ per person in a group, for 1 hour. During winter there is a swimming area cut out of the ice on the lake in front of the sauna.